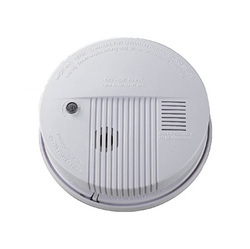 There are two main types of smoke detectors: ionization detectors and photoelectric detectors. A smoke alarm uses one or both methods, sometimes plus a heat detector, to warn of a fire. The devices may be powered by a 9-volt battery, lithium battery, or 120-volt house wiring. Ionization detectors have an ionization chamber and a source of ionizing radiation. The source of ionizing radiation is a minute quantity of americium-241 (perhaps 1/5000th of a gram), which is a source of alpha particles (helium nuclei). The ionization chamber consists of two plates separated by about a centimeter. The battery applies a voltage to the plates, charging one plate positive and the other plate negative. Alpha particles constantly released by the americium knock electrons off of the atoms in the air, ionizing the oxygen and nitrogen atoms in the chamber. The positively charged oxygen and nitrogen atoms are attracted to the negative plate and the electrons are attracted to the positive plate, generating a small, continuous electric current. When smoke enters the ionization chamber, the smoke particles attach to the ions and neutralize them, so they do not reach the plate. The drop in current between the plates triggers the alarm. Both ionization and photoelectric detectors are effective smoke sensors. 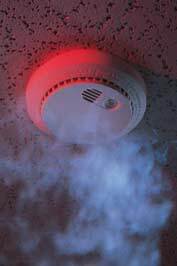 Both types of smoke detectors must pass the same test to be certified as UL smoke detectors. Ionization detectors respond more quickly to flaming fires with smaller combustion particles; photoelectric detectors respond more quickly to smoldering fires. In either type of detector, steam or high humidity can lead to condensation on the circuit board and sensor, causing the alarm to sound. Ionization detectors are less expensive than photoelectric detectors, but some users purposely disable them because they are more likely to sound an alarm from normal cooking due to their sensitivity to minute smoke particles. Recently, combination detectors have become available. These detectors feature BOTH types of sensor. The problem with them is related to the ionization detector’s fault of being disabled by users due to it’s supersensitivity to minute smoke particles as mentioned above. When it is disabled, the whole detector is rendered useless. THE CCVFC recommends, based on recent studies and for the above-listed reasons, that you install ONLY PHOTOELECTRIC smoke detectors plus CARBON MONOXIDE detectors on every floor of your home. Only this will give you and your family the safest protection against all types of fires that you could have in your home. Carbon monoxide is an odorless, tasteless, colorless invisible gas. Each carbon monoxide molecule is composed of a single carbon atom bonded to a single oxygen atom. 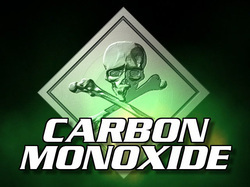 Carbon monoxide results from the incomplete combustion of fossil fuels, such as wood, kerosene, gasoline, charcoal, propane, natural gas, and oil. According to the Center of Disease Control, nearly 500 unintentional deaths and more than 1700 suicides are related to carbon monoxide poisoning each year in the United States. An estimated 3000 to 5000 people are treated annually for carbon monoxide poisoning in hospital emergency rooms, but it is believed that many more are misdiagnosed or never seek medical care. CO is the leading cause of accidental poisoning deaths. Carbon monoxide is normally present in low levels in the air. In the home, it is formed from incomplete combustion from any flame-fueled (non-electric) device, including ranges, ovens, clothes dryers, furnaces, fireplaces, grills, space heaters, vehicles, and water heaters. Furnaces and water heaters may be sources of carbon monoxide, but if they are vented properly the carbon monoxide will escape to the outside. Open flames, such as from ovens and ranges, are the most common source of carbon monoxide. Vehicles are the most common cause of carbon monoxide poisoning. Don't ignore the alarm! It is intended to go off before you are experiencing symptoms. Silence the alarm, get all members of the household to fresh air, and ask whether anyone is experiencing any of the symptoms of carbon monoxide poisoning. If anyone is experiencing symptoms of carbon monoxide poisoning, call 911. If no one has symptoms, ventilate the building, identify and remedy the source of the carbon monoxide before returning inside, and have appliances or chimneys checked by a professional as soon as possible. Don't automatically assume that you need or don't need a carbon monoxide detector. Also, don't assume that you are safe from carbon monoxide poisoning just because you have a detector installed. Carbon monoxide detectors are intended to protect healthy adults, so take the ages and health of family members into account when assessing the effectiveness of a detector. Also, be aware that the average life span of many carbon monoxide detectors is about 2 years. The 'test' feature on many detectors checks the functioning of the alarm and not the status of the detector. There are detectors that last longer, indicate when they need to be replaced, and have power supply backups -- you need to check to see whether a particular model has the features you require. When deciding whether or not to purchase a carbon monoxide detector, you need to consider not only the number and type of carbon monoxide sources, but also the construction of the building. Newer buildings may have more airtight construction and may be better insulated, which make it easier for carbon monoxide to accumulate. Low levels of carbon monoxide poisoning cause symptoms similar to those of the flu or a cold, including shortness of breath on mild exertion, mild headaches, and nausea. Higher levels of poisoning lead to dizziness, mental confusion, severe headaches, nausea, and fainting on mild exertion. Ultimately, carbon monoxide poisoning can result in unconsciousness, permanent brain damage, and death. Carbon monoxide detectors are set to sound an alarm before the exposure to carbon monoxide would present a hazard to a healthy adult. Babies, children, pregnant women, people with circulatory or respiratory ailments, and the elderly are more sensitive to carbon monoxide than healthy adults. Improper installation or poor maintenance of appliances. Inadequate ventilation of appliances, including fuel burning space heaters. In tightly sealed homes, negative pressure can force flue gases (such as those from wood stoves or water heaters) to reverse flow or backdraft into the living space. These incidents are the most difficult to detect. Age, overall health, length of exposure and the concentration of the exposure (measured in parts per million) all determine the degree to which a person becomes affected by CO.
A source of carbon monoxide poisoning, such as a smoldering fire, faulty furnace, kitchen range or water heater can produce up to 1600 ppm. A charcoal grill 3200 ppm and tailpipe exhaust can easily produce in excess of 70,000 ppm. The table below shows typical symptoms based on concentration and time of exposure. Carbon monoxide is often misunderstood. Because it is a component of smoke found from a burning fuel, people often equate it with fire and smoke emergencies. It can be deadly and should be respected, but it is important to understand it and how it affects humans. Myth #1: You can smell carbon monoxide and sometimes it has a taste. Fact: Carbon monoxide is odorless, colorless and tasteless. Sometimes when people say they can smell it what they are really smelling is the byproducts of the fuel that is burning, not the CO. These fuels can also cause a taste in some people's mouths. Myth #2: The only time carbon monoxide exists is if something is burning a fuel such as a fireplace, gas appliance or heating device. Fact: Carbon monoxide is in the air we breathe daily. Our bodies need a certain amount of it to function and are very good at processing what is not need out. Acceptable levels can even be higher than normal when our houses are closed up tight because of weather and we are running fuel-burning appliances properly. The human body can function normally even with slightly higher concentrations or through short "spikes". Our bodies are made to handle that. Myth #3: Carbon monoxide alarms should be installed and maintained like smoke alarms. Fact: While smoke rises, carbon monoxide is about the same weight as the air we breathe so it is all around us. That is why many CO alarms are made to plug into outlets at floor level because it really doesn't matter at what height in the room they are installed. Like smoke alarms, CO alarms should be tested and vacuumed at least monthly, batteries should be changed twice a year when you change your clocks and they should be replaced when they become 8-10 years old. Myth #4: Carbon monoxide alarms are notorious for giving false alarms. Fact: When they were first on the market, they were engineered to be so sensitive that they were alarming when no real danger existed. Fire departments made numerous calls to homes where no emergency had ever existed. In 1996 the standard was adjusted and this problem went away. Most of the original alarms have been replaced with newer ones but if you still have one you should consider replacing it because it is close to 10 years old. We still receive calls that show no abnormal reading when we arrive. These are not false calls though. Usually something actually caused a spike and by the time the fire department arrives the problem has gone away because the occupants have opened doors and windows. Myth #5: Carbon monoxide emergencies and fire emergencies are the same and should be handled in the same way. Fact: A fire is something that happens quickly. Fires double in size every 30 seconds. Carbon monoxide while it can rise quickly (such as lighting a fire place with a closed damper), usually it is something that happens over time (such as a small leak in a flue). Because of that smoke alarms are set to sound as soon as any smoke reaches them. Carbon monoxide alarms are programmed to sound if the levels of CO become dangerous over a set period of time. As we've said before, our bodies can take short spikes. That is why smoke alarms have one alarm that sounds when smoke is present. Many CO alarms have an "alert" alarm and a "warning" alarm. Alert usually means there may be a problem, investigate and let some fresh air in the house. Warning usually means there is a problem, get everyone out and call for help. It is important for you to read the instructions that come with your alarms and know the difference. Myth #6: I'll be able to tell if my house has an excessive level of carbon monoxide. Fact: You may not be able to. Symptoms of CO poisoning are very similar to flu symptoms. That's why having working CO alarms on each level of your home is very important. It could alert you to a problem that you might otherwise assume is part of the flu season. Reference Source: http://chemistry.about.com/od/howthingswork/a/codetectors.htmFor more information regarding carbon monoxide, please visit the Vermont Division of Public Safety, Division of Fire Safety.